You will need to choose entry and exit music, hymns and music to be played during the signing of the registers. Our organists are flexible in what they will play. The traditional entry music is The Brides Chorus from Lohengrin by Wagner. The traditional exit music is The Wedding March from A Midsummer Night’s Dream by Mendelssohn. However, you are also free to choose your own selections. You will see a selection of hymns below. Normally couples choose two hymns, but if your wedding is very small or you’re not really into singing, then you don’t have to have any. At the end of the service you and your new spouse will sign the registers. You will need to choose two witnesses that are over 18 years of age and these witnesses will also sign the registers (couples often choose their fathers for this). This can all take a few minutes so usually, some music is provided. 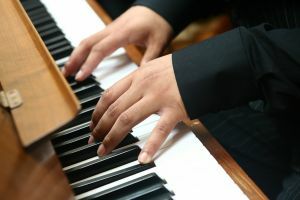 You can choose to have a friend sing or play, or you can choose a piece of music for the organist to play. Alternatively, you can let the organist choose something appropriate. keep me praising till the break of day. sing hosanna to the King of kings. keep me resting till the break of day. keep me serving till the break of day.